I don't know if this is listed somewhere in the Bro Code (I'm not a Bro...) but it SHOULD be. From now on, if you receive a blank text message from a friend, that is The Signal that they are trapped in an awkward situation (you and your ex ended up at the same party and your friend/date isn't there yet), horrible conversation (Creepy Guy From Work corners you at the grocery store and won't shut up about the TPS reports), bad date, job interview gone terribly wrong, whatever. The proper etiquette when receiving The Signal is to wait thirty seconds and then call the person with a "huge emergency". The job of the caller is then to listen patiently on the line for further instructions. For example, the person receiving the call could say, concerned, "Oh no! What happened?" It is then the responsibility of the caller to fill in the necessary silence, just to make it all a little more believeable. You could talk about your day or you could offer possible escape routes to your trapped friend. Anyway, the person receiving the call is in control here. If just a minor distraction was necessary and the awkward encounter has been diffused (ie, Creepy Guy From Work wandered off or your ex left the party while you were on the phone) then you can thank your friend and hang up. If it's something more serious, like a bad date that wouldn't end, this is your chance to escape! Politely tell your date that you've had a great time and you're sorry that you have to cut it short but (Fill in excuse here; be creative!) and you have to go rescue them. Hooray for friendship! The modification to The Signal is The Time Bomb. The Time Bomb is usually texted from a secluded location: the bathroom, outside, wherever, and gives a specific time frame for the callback, ie: COUNT TO 200 AND CALL ME BACK! This is especially helpful if you're in a situation where you can't covertly send the blank text, and will give you time to get back to your table, bar stool, interview, whatever before The Call is placed. Also I've been watching way too much HIMYM. Yay! Because I wanted to how EXACTLY how long 'til Christmas and now you can too! 7:40 AM, San Marcos, LBJSC Parking Garage: PARKING FAIL! CRUNCH. Know what that sound is? It's the sound my car makes when I back it into the wall of the LBJSC garage at 5 miles an hour. OOPS. As far as I can tell though the only damage done was a very small scrape on the bumper. Still, it made me feel like a geek. 7:57 AM, The Quad: FASHION POLICE I totally passed a girl in the Quad who was wearing the following outfit: black leggings under a hot pink knee-length skirt with a white button-down shirt under a cream-colored vest. Not a joke. Unfortunately I was too sleepy to whip out my phone and get a picture but I'm PRETTY SURE I am not making this up. When I texted the description to Katie, she wrote back: Oh! First day of school in 1985! 8:00 AM, Taylor-Murphy History Building: CAN'T GO THERE Yup there's something ridiculously awesome about my 8:00 am class. I can't put too many specifics here for fear of it maybe one day somehow weirdly working its way around to the wrong person who might take offense but I will just say: Milton Waddams and the Impressive Clergyman. Ask me in person if you need more details. 12:17 AM, ELA women's bathroom: IMMEDIATE SOCIAL REJECT FAIL I didn't even know that people do this but...there was seriously a girl at school with her MOM today. Yeah - IDK either. Like there they were going from class to class and the mom was carrying a big Bookstore bag and the girl had her backpack and everything. I thought I had trouble cutting the apron strings and going off to college but never EVER in all my fear and insecurity did I think for a second to ask my mom to come with me. Never. Ever. Ever. 2:00 PM, ELA: FASHION POLICE, PART TWO Chick walked in to my last class of the day wearing ill-fitting stretchy cuffed dark blue denim shorts. I mean, there are indeed worse things that someone could wear to class. What made this a fashion fail was the white button-up sleeveless shirt she wore with it. It had all different color stripes on it and it was...TUCKED IN. Un! Flattering!! Stacy London would've had an embolism. 2:58 PM, ALKEK STEPS: RETURN OF THE FASHION POLICE! Ugh, was there some "Wear your ugliest outfit" contest that I wasn't aware of going on today? Do these people dress in the dark? WHAT IS GOING ON!? Girl comes walking down the Alkek steps in a bright yellow top with a purple cami-vest thing (couldn't really tell what was going on there) over it. Ok...I could let that go. But she had paired it with skinny jeans that were kind of loose around her thighs but skinny on her calves (think AC Slater pants!) and had light blue seams sewn down the front of either leg, from hip to ankle. Bottoming out this atrocity were pointy black boots, worn UNDER her skinny jeans. OMG. Barf. 3:06 PM, LBJSC GARAGE: TX STATE'S BANK ACCOUNT FTW! It now costs $10 to park your car in the LBJSC garage for eight hours. WTF?! Texas State, really? You hike up my tuition higher than my financial aid will pay, you charge an arm and a leg for perimeter parking and don't run enough buses to carry everybody, you raise the price of a one-way bus ticket from Austin to San Marcos to $6 (it's now cheaper to drive my car to San Marcos, gas-wise), AND you're gonna charge me ten bucks to park in your garage? I hate you. Can't I just give you my spleen, my pet unicorn, and my firstborn child and call it even? Jeezah! So there's my day in a nutshell. Crazy, I know! Best first day of school ever, though, because now I remember why I started this blog to begin with. It's the ridiculous! And the awesome! And oh how I've missed it. I made this Mexican casserole thing for dinner (which, if you're reading this, COME OVER because there's tons and tons of leftovers) and decided that guacamole would go well with it so I whipped some up and apparently the jalapeno I used was, like, super jalapeno because I've washed my hands like four times since then and I am STILL randomly burning my mouth and eyes by accident. Uncool! In other words, the job search is going meh and school starts on Wednesday. All in all, I just want the weekend! Not a good sign on a MONDAY. K TTYL. My Friends Are Smart Asses. So I drove to Belton today to come see my grandma and because we're going to Arlington tomorrow to see my great aunt Pat (it's her 82nd birthday!) and there was some CRAZY FREAKY weather on the way up here! Like, we're talking this massive electric storm with tons of cloud-to-ground white and blue lighting all over the place and thunder that was shaking my car and about halfway through it the rain started coming down in buckets like God decided to water his lawn today and his sprinkler was stuck on the "SUPER HIGH" setting. Really, really kind of scary. ME: What do you do if your car gets hit by lightning? DALE: Don't know. I think panic would be good! You are all absolutely UNHELPFUL!! The only helpful person was Andrew who correctly told me to STAY IN MY CAR if it got lit up. And then eventually (after I got to Belton and was safely inside the house) Dale called to tell me that not only do you stay in the car you also apparently have to open the door and then bunny-hop out of it so that you don't touch the car and the ground at the same time which will apparently shock your stuff. So thanks Andrew for taking care of your friend('s wife, LOL) and also I guess Ben for making sure I didn't get out of my car with an umbrella. Blar. My official new hero? Whoever randomly put this picture on TV for no apparent reason what so ever during a broadcast of The Morning Show with Mike and Juliet. Not that I *watch* that show, I saw it on The Soup, and when I did I laughed and laughed and had to rewind and watch and laugh some more. 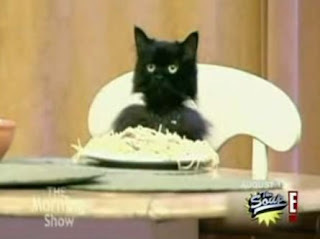 And so I give you...SPAGHETTI CAT! That one cupcake place in Lakeline Mall that used to be the Rocky Mountain Chocolate Factory is AWESOME. Survey says: their red velvet cupcakes are better than Sprinkles' red velvet cupcakes AND they don't have those horrid wooden forks! And theirs are a little smaller than Sprinkles (Although they MAKE big cupcakes, they only had one variety of the big ones when Katie and I were there) and they're also way less expensive. But yeah, it was a total cupcake win: better cupcake, better value, and you get to eat with a plastic spoon instead of those wooden forks that send awful chills up my spine because I find the feeling of wood in my mouth (HA! Ok I'm 13.) to be absolutely intolerable. The only fail of the experience was that I went low carb/low cal this week, so I could only have half of my delicious, delicious cupcake. Everybody better go get cupcakes from them because if that place goes under I'm 100% blaming everybody else and also going to maybe die. So newsflash: I love the Olympics. Like, love to the point where it becomes a little crazy and obsessive and I'm not really doing much in the evenings these days because I'm watching the Olympics instead. I've always been this way, and I do it during the winter Olympics too just not as much because let's face it, I can count the number of days I've spent in a "winter" environment on my fingers. Anyway. I am so impressed by what we're capable of. Usually I look at what we as human beings have done and kind of shake my head and sadly say "Damn..." but the past couple of days watching people who have sacrificed, driven, dreamed, and pushed their entire lives for these few days has reaffirmed my faith that we are capable of being bigger. Rising above is humanity's natural state, and I feel like we move further from that with each war, trashy reality show (oh how I love them), intolerant state of mind, hateful word, fast food chain, impatient moment, and political decision. But sitting in my parents' living room flipping out over an intensely exciting swimming race (I'm just saying...don't make four American athletes angry before you jump in the pool with them. Consider THAT a lesson learned, France.) jumping up and down with my family and our dogs(!) and knowing that across the world there are hundreds of thousands of people feeling the same way, doing the same thing, I am reminded that we are all connected all of the time. I might not know any of their names, where they come from, what they believe in, but it absolutely does not matter. The point is that they are exactly the same as me on a human level, and because we are all exactly the same, we are all individual pieces of something much bigger and more powerful than any of us know. And we are all connected from birth until death, whether we nurture the connection or not. It's an amazingly comforting thought and it's the reason that I geek out with anticipation months before the opening ceremonies. It's why I love Christmas time - there is nothing that I share with more people on a more regular basis. I love feeling human. I'm totally bringing back "Rad". It's super functional, brings back good memories, and is really fun to say. So spread the word, RAD is back! Oh and don't be like Dale and when I say "You're so rad!" look at me confused-ly and say back "Resident Assistant on Duty?" because no, you're not R.A.D., you were RAD but now you're a NERD and also maybe have been at your job too long. So YES, RAD ie. "TOTALLY AWESOME". Use it today and get a gold star!! So here's a perfect storm of awesome: what do you get when you have no plans, your class is cancelled the next day, and your husband is having a guys' night with beer and guitars? GIRL'S NIGHT. I can't even say how much I've kind of needed a night like this. Nothing to study, just me and a glass of wine (I even locked the dog out of the bedroom!) and in a few minutes the DVD of my choice. I love it. Also I just got out of the shower so I'm nice and warm and clean and that's an added bonus and maybe a little too much information. So Katie's been after me for a few weeks now to write my Stupid and Trashy blog. The truth is, I have these classmates who I refer to as Stupid and Trashy because those are the adjectives that I felt (and sometimes still do feel) best describe these two people, but they've actually grown on me to the point where they've become hard to complain about. Especially Trashy who, it turns out, just operates by putting 100% of herself out in the open - her judgements, feelings, opinions, the works. So while it seemed trashy in the beginning to just hear hypocritical statement after hypocritical statement while she and Stupid had conversations that included the statements "I don't think women should be president - I'm a woman and I know how emotional we can be." and then called me a feminist(!) for saying that I've seen more men than women get into bar fights over stupid things and that women are perfectly capable leaders. Yes, that day was ridiculous and it was, in fact, the day that they were anointed Stupid and Trashy. But still. Even a fungus will grow on you if the conditions are right. The truth is that Stupid and Trashy have become the lesser of all the evils of Anatomy and Physiology class. For one, they're HILARIOUS and for the other...I'd take Stupid and/or Trashy of Obnoxious, "I Don't Get It", "I Have A Story", and "I Have A Better Story Than She Does", which are all other people in my class. That's where the real bitterness lies, and THAT, my friends, is where the real meat is, and it will have to wait until tomorrow. That's right, you finally got your Stupid and Trashy blog but...yeah I know it was disappointing. :-) I have to leave you wanting or you'll quit reading my blog! You...two people who read my blog. ;-) Have a nice day! I went to Target today to pick up a few things and I was carrying my little basket, meandering through the aisles, and I passed this mom and her three children. The mom was talking to the older two who were walking beside her but the youngest was maybe 2 or 3 and riding in the shopping cart. I'm not kidding, all he was doing was sitting there going "BAA! BAA! BAA! BAA! BAA! BAA! BAA! BAA! BAA! BAA!" and the awesome part was that the mom and other kids were just totally cool about it, chatting away about other things while this kid imitated a sheep for no apparent reason. Confused, I texted a few people asking what they thought was up with this kid and why he was acting like that. I got some great responses but by far the best one was from my friend Christina, who teaches a resource class in an elementary school. ME: So I'm at Target and I just passed by this kid who is saying "BAA" like a sheep over and over. Diagnosis? CHRISTINA: KAR - Kid Ain't Right - that's our diagnosis when we observe a kid and are like WTF! I totally LOL'd in the middle of the picture frame aisle at Target. That's a diagnosis win if I've EVER seen one. Oh John Mayer. Put yer shirt back on. "I want you to know it's all about the music. It's always been about the music." Umm...then why, John Mayer, are you preaching instead of playing music? Rule number one of impressing me is always show me don't tell me, because the number one sign of fakeness is being all mouth. So anyway, you might know that I was at the Brett Dennan/Colbie Caillat/John Mayer concert in Dallas with Katie last weekend, and those of you who received my text messages know that I was dismayed and offended by JM's horrendous cover of "Free Fallin'". And when I say offended I mean that was, like, my fave song when I was a kid and nobody can do it like Tom Petty so...don't even try. And also he did a Stevie Ray Vaughan cover. I'm sorry, it just seems like when you've got tons of hits and literally hours of your own music that you could be performing it's a bit arrogant to sing someone ELSE'S music at your show. Sure, if you feel so compelled, play a cover - ONE cover - but not three, unless they're really awesome. Which, BTW, they weren't. So John Mayer? Officially tool-riffic. Also Perez got a hold of some pics from his Dallas show and called him gay. Thanks to Moose (A victim of my angry texting!) for passing that info along. Love you!